Handball scoring system. 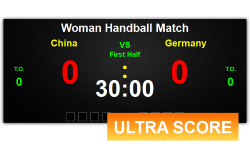 It supports scoring, timing and player penalty function during the handball match. Scoring and Timing software for Handball match. It can be used to display: Score, Match Timer, Foul Times, Timeout Times, Player Points and Player Foul Times as well as the advertising during the match. The professional statistics software for Handball match. It can record all events during the handball match and export the statistics report which can be used to help the coach and the player to analyze the whole match. It can be used to display scoreboard on the LED screen. This software has already been used for various international matches. Be used together with Handball Scoring Software.